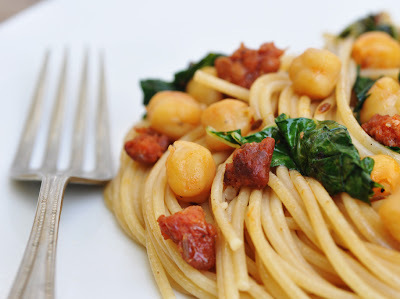 Inspired by a few green leafy vegetable recipes that combine either with chick peas or with Chorizo, I decided to throw everything together and make a quick weekday pasta dish out of it. I remember seeing Nigella Lawson once using Chorizo and scallop for a quick dinner dish on TV, and thought that would be a good start (even without the scallops). After checking her cookbooks, I saw that she liked to combine chickpeas and green leaves in another dish. The Chorizo provides a lovely meaty flavor, and, as with bacon, you don't really need much of it to get that. No additional oil or fat is need as the Chorizo extracts enough to cook the spinach in. The chick peas are precooked and basically just need to be reheated. All in all another pasta dish in which the pasta takes longer to cook than the sauce. I love that!! Drain the cooked spaghetti and transfer to serving bowl. Stir in the Chorizo chick pea mixture until spaghetti are well coated. Serve immediately.